"I run my unit how I run my unit. You want to investigate me, roll the dice and take your chances. I eat breakfast three hundred yards from four thousand Cubans who are trained to kill me, so don't think for one second you can come down here, flash a badge and make me nervous." It is frustrating that truly talented people more often than not achieve great success with very little difficulty. I find it amazing to hear about talented musicians who write a song in minutes or a doctor who saves lives. While perhaps not as important to the future of western civilization, authors and screenwriters amaze me daily at their ease with the written word. At the top of the list of screenwriters that dazzle me routinely is Aaron Sorkin. Since penning a stage version of A Few Good Men, Sorkin has gone on to write The American President, Bulworth and the brilliant television shows Sports Night and The West Wing. Sorkin is nothing short of genius when it comes to conveying emotions, and this skill is present in the film version of his stage play, A Few Good Men. Private Santiago isn't exactly a model Marine in the eyes of his superiors at Guantanamo Bay, Cuba. Because of his inability to maintain the same level of performance as his peers, Corporal Dawson and Private Downey give Santiago a Code Red. For the unintiated, "Code Red" is a garden-variety term that includes such forms of hazing as five minutes of being punched in the arm, having glue pored on your hands, or getting your head shaved. However, Santiago dies as a result of his hazing, and the perpetrators are charged with murder. To most, the case is seen as open and shut. Lieutenant Daniel Kaffee (Cruise), a Harvard Law School alumni of nine months, has never seen the inside of a courtroom, having successfully plea-bargained 44 cases in his time with the JAG office. So when he is assigned this case, it looks as though it will be yet another plea bargain and the incident will fade away without fanfare. One lawyer who does not share Kaffee's outlook on the case is Lt. Commander Galloway (Moore) who believes that the murder has something to do with "Code Reds" being ordered by one of the highest ranking officers on the base, Col. Jessup (Nicholson). 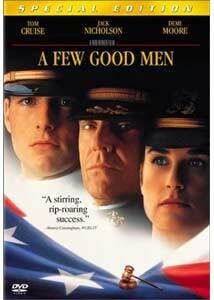 A Few Good Men is, on the surface, nothing more than a standard courtroom thriller. The film even has all of the tried and true clichés of the genre down so well, one would think that Sorkin had a study guide. But that is not to say that the writing doesn't crackle with great lines and powerful emotions. Sorkin does seem to have a difficult time making the film suspenseful, and by failing to create tension, the picture falls short of the great film it could have been. It is usually the mark of a spectacular screenplay that the viewer has no clue what will come next, yet in A Few Good Men, we do know what will happen. It isn't because we can figure it out, it is because the characters tell us what they are going to do, and how they are going to do it. The final scene in the courtroom between Nicholson and Cruise, one that has become widely popular, still works, even with the level of surprise removed. The cast list for A Few Good Men reads like a who's who of amazing actors. Cruise is wonderful as Kaffee, and his performance ranks as one of the best he has ever given. Moore has good chemistry with Cruise, and holds her own in the only female role. Nicholson received many deserved accolades for his performance, and will forever go down in history as the man who roared the words, "You can't handle the truth". Supporting performances by Kevin Bacon, Kevin Pollak, J.T. Walsh, Kiefer Sutherland, and Christopher Guest are nicely done. Image Transfer Review: Nearly identical to the original 2.35:1 anamorphic widescreen transfer, this new special edition is still of the highest quality. Detail and sharpness are each excellent with a nice film like quality to the image. Colors are vibrant and crisp while the black levels are spot on as the scenes that are darkly lit and at night come off looking beautifully. A few moments of edge enhancement and pixelation are evident, but even with those flaws this transfer is impressive. Audio Transfer Review: The original DVD release included a English 2.0 Dolby surround track, and it is unfortunate that this new Dolby Digital 5.1 mix fails to improve upon the previous release. The most evident change with the new 5.1 mix can be heard in Marc Shaiman's score as it comes across very well in each channel. Dialogue is clean and sounds natural with no problems. English, Spanish, French, and Portuguese 2.0 tracks are also available. Extras Review: When it was originally released in 1998 Columbia included nothing more than production notes to whet our special feature appetites. Nearly three years later a full-fledged special edition has been released with some nice extra features. The most interesting of these features is a 34-minute documentary entitled Code of Conduct. This documentary features interviews with Rob Reiner, Aaron Sorkin, Kevin Bacon, Kevin Pollak and Kiefer Sutherland. While the documentary is more geared towards the acting side, it is informative with a view at the casting of the film and the experiences that those interviewed had while making the film. Next up is a new audio commentary track by director Rob Reiner. Much like his other commentaries Reiner fails to bring much to the table for his takes on the film. There are long periods of silence, and many of the times when Reiner has something to say, his comments are generally uninteresting. I realize that I am a moron, but the thought that kept crawling through my mind was why not have Aaron Sorkin do a track, now that would be entertaining. Speaking of Sorkin, he does show up in A Few Good Men: From Stage to Screen, a 13 minute featurette with both Sorkin and Rob Reiner that shifts its focus on transforming the film from stage play to screenplay. Sorkin talks openly about his inability to write a screenplay as he started and the help that he needed to make things work. This is a very informative featurette. Theatrical trailers for A Few Good Men, Jerry Maguire and The Juror as well as talent files round out the extras on this disc. A Few Good Men ranks as one of my favorite films of the past ten years. Sure, the script shows its hand a few too many times, but with dialogue and acting that is off the chart, who cares. This isn't a movie that is a "must own" for everyone with a DVD player, but if you haven't seen it, rent it, you won't be sorry. If you have seen it and like it, go get this new special edition, and come over and quote the movie line for line with my friends and I. Sure, the film has its problems, yet I never get tired of watching it.